An ‘impossible’ state of matter heralded as the world’s first ‘time crystal’ has been created in a laboratory five years after the existence of these fourth dimension atoms was suggested. The ‘time crystal’ was created using a chain of atomic ions which move in a pattern that repeats in time rather than space. This contrasts from other crystals such as salt, snowflakes and diamonds which are arranged in repetitive 3D patterns. Researchers from a number of US educational institutes including the Joint Quantum Institute and the University of Maryland published their groundbreaking discovery in Nature. 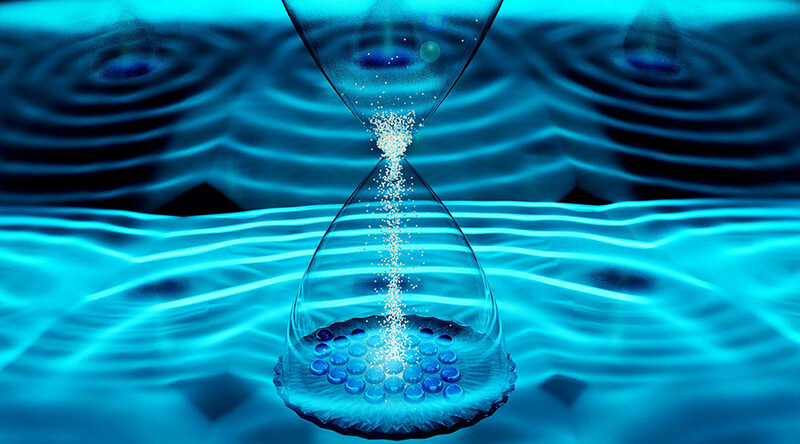 Lead author and JQI postdoctoral researcher Jiehang Zhang, said that nature usually responds in sync to things that change in time, however time crystals disturb regularity in time. Using laser pulses, the team triggered a behavioral change through a chain of 10 ions. The ions spun around with each pulse before slowly syncing up with one another. “They would rhythmically return to their original direction at half the speed of the laser sequence,“ researchers explained in a statement. The time crystal created by the researchers also met the required criteria for being a ‘rigid’ structure, as shown by the scientists’ efforts to “melt” or shake it. Due to its rigidity, the crystal has the potential to be used in quantum computers and a better understanding of the phenomenon “could help bring such systems into future quantum devices,” according to JQI Fellow Christopher Monrow. The time crystal produced in this study lasted less than a millisecond. A month later though, a team led by Mikhail Lukin at Harvard University created a second time crystal, formed from natural defects found in a diamond rather than from ions. This research is also detailed in Nature. The discoveries follow a 2012 proposal by Nobel prize-winning physicist Frank Wilczek that it may be possible to create crystals that are arranged in time instead of space.